The Minister of Finance, Mrs. Kemi Adeosun, has said that Nigeria is “technically’ in recession. Adeosun said this at the Senate on Thursday while speaking about the state of the nation’s economy and the implementation of the 2016 Appropriation Act. She also said the violent activities in the Niger Delta had affected government’s revenue. When asked by the Senators if there was a strategy by the government to diversify the economy, Adeosun said the Federal Government was tackling the problem by bridging the infrastructural gap. “The fundamental thing needed to diversity the economy is infrastructure and we are attacking the infrastructural deficits,” she said. The Minister said that President Muhammadu Buhari’s government inherited salaries and wages of N169 billion and now reduced to N159 billion. 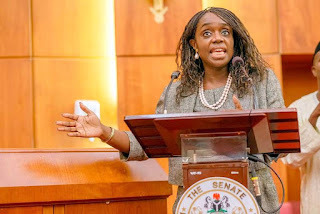 According to her, a total of N247.7 billion has so been released as capital expenditure, with plans to release N70 billion very soon, adding that the government will continue to release as soon as the nation’s stimulus improves. The minister told the Senate that all the releases are cash backed as a priority of government.